As we near the end of September our thoughts jump to sweaters, everything pumpkin, and holidays! For most of us those thoughts are welcomed and exciting. For others of us, the thought of holidays and company mean stress. We stress over making our homes company ready and we may even stress about having people in our home that we have to entertain and prepare for. Declutter. This is an ongoing process. Take some time to go room to room and get rid of things you don’t need. Either throw them out or donate them. Often times we get used to just seeing things laying around, even if they no longer serve a purpose. Be intentional about this. Clean and freshen. Start with the room and bathroom your guests will be using. Change the sheets, dust the room and vacuum the carpet. Take some time to freshen up the bathroom (wash rugs & towels, wipe down the counters, clean the shower and toilet). Add homey touches to bedroom. Adding small touches to the bedroom make it seem that much more inviting. You can go as small as adding a candle and a few books or even some chocolates on the pillow. Just a nice touch that shows your guests you went out of your way to prepare for them. Add amenities to bathroom. Once again, the amenities don’t have to be huge or expensive. Put some fresh flowers in the bathroom, buy some small bottles of shampoo, conditioner and leave them in the shower. You could even buy small bottles of lotion or hairspray for your guests to use. Stock fridge. This is an obvious one, but you also want your guests to have access to plenty of food. You could take it a step further and if you have guests with dietary needs, you could set aside a small spot in the fridge or cupboard for them and stock it with food they can eat. Gestures like that can go a long way! Remember, the holidays are a time to enjoy family and make memories! 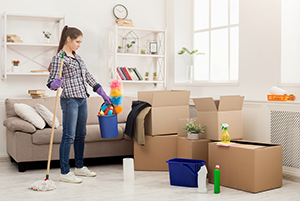 While you are in the process of cleaning up for holiday guests, know that we have home storage and business storage options in California, Arizona, and Nevada. We’re nearby to help you store your items if it seems too overwhelming to start throwing things out or donating them. Give yourself a break and store with us until you have time to look through them after the holidays and guests are gone. You’ll be thankful for more space in your house and the ability to focus on family! This entry was posted in Holidays, Organizing, Seasonal on September 28, 2018 by George W.
Back To Dollarselfstorage main site.